When I was a kid, I had an irrational love of Tootsie Rolls. Not so much anymore. Since I went gluten-free and started cooking from scratch, eating in season, and eating whole foods instead of stuff out of boxes, I’ve lost my taste for overly sweet foods. The high fructose corn syrup just doesn’t like me, it seems. In fact, to my complete surprise, I seem to have lost much of my sweet tooth. The Chef doesn’t really have one, and so we eat far fewer sweets each month. You never could have told me that going gluten-free would change that in me. But when I haunted the sidewalks for Halloween, dressed as an LA Dodger or a bunch of grapes, I looked eagerly into my bag after every house. Tootsie Rolls? Cool. Most of them never made it home. But if they did, I sorted my haul into the luxury items (Reese’s Peanut Butter Cups) to the dreadfully disappointing (Jolly Ranchers — they always left an acrid burning square on the roof of my mouth). Always, I ate the Tootsie Rolls first. I shrugged my shoulders and said, “I know. I like chocolate too. But Tootsie rolls have their own taste. I like that.” And it’s true. A Tootsie Roll doesn’t taste anything like chocolate. There’s a certain waxy, pliable bend to them, a wave of sweetness. Once popped onto the teeth, Tootsie Rolls take longer to chew than most eight-year-old’s attention span. They taste like brown and sugar. Not brown sugar. Brown. And sugar. Still, I loved them for what they are. Not an imitation of chocolate. Themselves. That’s how I feel about gluten-free baking. I hesitated — and wavered — about putting the recipe for crusty sorghum bread in my book. I’m happy with the recipe. Really, for gluten-free bread, it’s good. But that’s the thing. It’s gluten-free bread. Gluten-free bread will (in my experience) never be featherlight, whirled full of air like a French baguette, or spongy and bendable, like my old Gumby and Pokey dolls. You know why? There’s no gluten in it. When I was first diagnosed with celiac, I decided I didn’t need bread. Even though I had sauntered into Macrina Bakery nearly every other day for a fresh loaf of kalamata olive bread with sea salt strewn on top, I accepted my fate. No bread. However, over time, I changed my mind. Make a great potato leek soup, and you want something to dunk in the dredges. If you want crab cakes at home, you need breadcrumbs. And sometimes, I still like peanut butter toast. So I started making gluten-free bread. And after a year or more of making it, I came up with some recipes and innovations. Some of the attempts tasted, at best, like a bagel. Others had the texture of compressed sawdust. I could create a decent taste, a lovely crumb. But there was no crunch, no crackle beneath the teeth that signified a great bready experience. So, inspired by the mania for no-knead bread, I adapted the technique of high heat, a cast iron pot, and thirty minutes of steamy baking. That first loaf had a thump, a crunch beneath the knife that inspired me. And you know what? It tasted pretty damned great. The Chef and I tested that bread, many times, with tiny variations. Bread is fickle. It responds to humidity, to heat, to how much you work with it. That’s true for gluten bread. Think about the chances for it to go askew without gluten. And we ended up with bags of gluten-free bread crumbs in our freezer. He took them to the restaurant.) The recipe you can read in the book is our best attempt. We were proud. We still are. But I’m just realizing, now, that if you are recently diagnosed, and you make that sorghum bread, you are likely to be disappointed. You’re going to think, “This is it?” You will have missed the hundred conversations, the unspoken tensions, and the attempts that finally calm your mind and help you accept that it will never taste like good gluten bread. But that’s okay. Just think of all gluten-free baking like I regarded those Tootsie Rolls. It’s not chocolate. But it becomes its own fascination, a taste you crave. Last night, the Chef brought home seafood chowder for dinner. It was, without a doubt, the best chowder I had ever eaten: chewy with mussels and clams; savory with shrimp stock; spiky with a touch of brandy. After my first bite, I hit him on the arm and said, “Shut up!” And then we both cut off a hunk of the sorghum bread I made last night, and dunked it into our soup. I felt like a kid at Halloween. I’m still learning about gluten-free baking. I always will be. But there are a few secrets I have learned. 1. Focus first on the foods that are naturally gluten-free. There is so much bounty. 2. Play. Experiment with a dozen little flours and see what combinations work best for you. Don’t go by my recipes exactly, or anyone’s. Make it once as you read it. And then play. 3. You have to combine. One gluten-free flour does not wheat flour make. Find your own combinations. 4. Accept your fate. Instead of constantly bemoaning the fact that you cannot mindlessly dump in a cup of white enriched flour, think of this as a chance to learn. Everything will shine if you live this way. 5. Remember. It will never taste like the food you are used to eating. But slowly, it will become something else, something with which you will feed yourself. 6. Food is beautiful. Enjoy the mistakes and laugh, a lot. Take raw, blanched almonds, grind them to a fine flour (but not so much that they become almond butter), and you have almond flour. This and other nut flours — such as chestnut and hazelnut, macadamia and pistachio — add protein and vibrant taste to gluten-free baking. The tiny whole grains that make a surprising breakfast cereal can be ground into a fine flour. Frankly, I have never successfully ground them in the spice grinder. I buy this flour in small bags, and add it in handfuls to crepes and quiche crusts. Amaranth has a grassy, earthy taste, so it works best in savory dishes, like pizza dough. The name alone is enough to make you want to try it. Legend has it that the Arawak people of the West Indies, long before the arrival of Columbus, used arrowroot powder to draw out the poison from arrow wounds. Hopefully, it will have similar beneficial properties for those of you cooking gluten-free. It is best used as a thickener, for rouxs and sauces, and fillings for fruit pies. Those who are allergic to corn are especially grateful for the existence of this starch. Dried beans can be ground into flours as easily as grains can. Chickpea flour — also known as garbanzo bean or ceci flour — makes a memorable flatbread in the south of France. Lentil flour shows up in Indian cuisine. Even fava beans become flour, and show up in some commercial gluten-free baking mixes. Experiment with the beans you like, in small doses. You may not have heard of corn flour yet, but you have eaten it. Have you ever enjoyed a corn tortilla in a Mexican restaurant? That was made of corn flour. After corn kernels have been dried, soaked in lime water, and then washed, the corn is ground into a fine flour. Buy some authentic masa harina (as Mexican cooks call it) and make your own corn tortillas at home. You can also try it in gluten-free corn bread. The seeds of the guar plant, which grows in India and Pakistan, make a granular flour when dried and ground. Take a look at many processed foods — such as commercial ice creams and puddings — and you will see guar gum on the list of ingredients. In small amounts, guar gum can be a somewhat effective binder, mimicking some of the effects of gluten. Mild and ever-so-slightly sweet, millet is an adaptable grain. It soaks up the tastes of the foods surrounding it. It sings in harmony, rather than blaring out loud. Millet flour lends a crumbly texture to breads and muffins, and it is especially good in quick breads. As a grain, quinoa is nutty and delicious. As a flour, quinoa is a little bitter. It is packed with protein, however, and the texture adds density to gluten-free baked goods. I like to use a little quinoa flour, in combination with other gluten-free flours, in something savory: cheddar-cheese biscuits; zucchini bread; or herb muffins. When rice farmers harvest rice, they shuck the grains of its outer husk, which is inedible. What is left after this process is brown rice. If the farmer also removes the germ and brain from the rice grain, he or she is left with white rice. Brown rice flour is made from the first type of rice, and white rice flour is produced from the latter. Whether it is brown or white (or black or green), rice comes in three different categories: long-grain, medium-grain, and short-grain. Each type can be ground into rice flour. The starchiness of short-grain rice makes it the perfect candidate for rice flour. Smooth and finely ground, sweet rice flour thickens sauces and gravies so well that no one eating them can tell they are gluten-free. It is astounding that people in India and across the continent of Africa have been eating sorghum for generations, and I only discovered it when I had to go gluten-free. To me, sorghum flour is the closest in texture and taste to traditional wheat flour of any of the gluten-free flours. I’ve come to love it, and I use it in nearly every baked good I make. In a few cases, it even works as a direct substitution for wheat flour, such as in pancakes. It makes the basis for a decent gluten-free bread, which is a godsend. Some people, however, detect a bitter taste in sorghum flour, so you should try some for yourself. What we in the West call tapioca comes from a plant originally from Asia, known as cassava. (In South America, it is known as manioc.) When the root has been dried, it is ground into a white flour. This tapioca flour is also known as tapioca starch (just to confuse us). Its starchiness makes it an excellent gluten-free flour, but it must be used in combination with other flours to make great baked goods. The tiny seeds of teff make a fascinating porridge. Dark brown as molasses, with a slight taste of chocolate, teff porridge will fill you up in the mornings. You can also cook up the grains the way you would polenta. As a flour, teff is nearly miraculous. The fine flour — ground from the tiny seeds — almost dissolve in baking, giving it a slightly gelatinous quality. This binds the baked goods in a somewhat similar fasion to gluten. Teff flour adds to fabulous waffles and banana breads. Geeky chefs in love with molecular gastronomy adore xanthan gum. So do commercial food producers, who put xanthan gum in salad dressings and frozen foods as a stabilizer. If you have ever looked at the ingredients of your toothpaste, you saw xanthan gum there, since it binds everything together in a uniform consistency. Now, you can buy some for your gluten-free baked goods. Only a tiny amount (1/2 teaspoon or less) is enough to bind that dough to make cookies and pie crusts. And of course, there are so many other options, ones I'm excited to explore more fully. 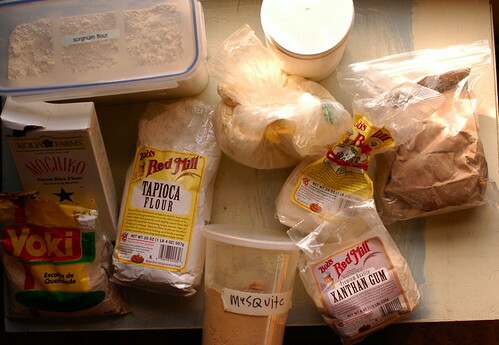 Pea flour, mesquite flour (we have some, as you can see from the photo above, given to us by the lovely Shuna for our wedding, but life has interceded between me and the mesquite flour baking), soy flour, kudzu starch (thanks for the tip, Nina! ), and Montina flour. As the world becomes more and more aware of the need for gluten-free alternatives, I'm sure we'll find even more options. If any of you reading have suggestions of which flours to use, in specific combinations, for particular baked goods, by all means — fire away! We all have so much to learn from each other. Now, go forth and bake. And once you have played, and the flours feel familiar under your fingers, you might create something like this cobbler, which the Chef has been making at the restaurant through October. All the customers eat it, not just the gluten-free ones. Everyone is sighing into the wine-rich taste of the apples and pears, mingled with cardamom, topped with this glorious crust. Forming the dough. Combine all the gluten-free flours with the salt, sugar, cardamom, and cloves. Cut the pieces of butter into the flour until the mixtures comes together and has the texture coarse cornmeal. Spoon in the sour cream and stir the concoction with a rubber spatula, until it all just starts to come together. Stop stirring. Making the dough ball. Put the completed dough between two sheets of plastic wrap or parchment paper. Form a large ball of dough between the sheets, and then flatten it into a square. (Do this gently. This isn’t the opportunity to work out your animus.) Set the dough square into the refrigerator and let it chill while you prepare the filling. Preheating the oven. Turn on the oven and let it heat to 375°. Preparing the fruit. Peel the apples and pears. Remove the cores of each of them. Cut the apples and pears into small cubes. Lay them all into your favorite baking dish (pie plate or 9-inch cake pan does well here). Squeeze the lemon juice over the fruit. Sprinkle the sugar over the apples and pears. Toss the ground clovers on top. Splash the vanilla extract over it all. Stir it up. Finishing the cobbler. Retrieve the dough square from the refrigerator and carefully lay it over the prepared fruit. Slide the baking pan into the oven and close the door. Bake for 35 minutes and check the color and consistency. When the cobbler topping has a firm feeling and is lovely and brown, the fruit bubbling up the edges of the pan — the cobbler is done. Let it cool a bit — you don’t want to burn your mouth — and then eat, with great gusto. Hi Shauna - I just found your site via notmartha.org. I didn't know anything about celiac disease or gluten before I came here, although I'm familiar with thinking differently about food, as there are several diabetics in my life. I've really learned something here! But that's not why I'm leaving a comment. I want to say that you are wonderful and inspiring to read. This is beautiful, sensual prose. Your stories and journey have made me cry and smile and get hungry. As much as you love food, I think you love words as much, with the care you give them. FOOD: Isn't food great? The variability, the potential. I think that having to really think about your food is no chore, it merely leads to pushing boundaries and finding tastes and experiences you wouldn't have had otherwise. I want to try your recipes and food ideas just because they sound really good. If being gluten free leads to such a delicious, joyful experience of life, who wouldn't want to try? As for Tootsie rolls, I absolutely love them - it was the first American candy I tried when my family and I got to the States! And I still have a sentimental fondness for them. No soy flour? It's gluten-free, it adds protein, and most supermarkets carry it. Shauna, I'm really enjoying your posts! My daughter has food allergies, so we've gone GF (as well as soy, dairy and egg free)--your primer on flours is helpful! You put into words what I've been discovered about alternate flours--they are their own, and you need to adjust your expectations. I find the longer MAM is away from her allergens, the more accepting she is of alternatives. Thank you for all of the info! Thank you, thank you, thank you! For the wisdom, the stories, the gf flour guide, the cobbler. Thank you. Have you ever explored the possibilities of Kuzu, aka Kudzu root? As you know, I lived in Georgia for 15 years. Kudzu grows everywhere and takes over everything. It's considered a nuisance weed in the South, but it was actually brought in from Japan to control erosion. The huge root balls of Kudzu are used to make an amazing macrobiotic starch, Kuzu. It's amazing what we don't do with what we have growing in abundance in this world. Off to the island- and hope to see you soon! Your post could not have come at a better time for me. I was diagnosed in July, and after several months of unmitigated joy at simply feeling better, I think I'm entering the 'mourning' period. I was moved almost to tears this morning as I stood in line at Trader Joe's with my gluten free ginger snaps, watching the woman in front of me pay for her blue cheese and loaf of crusty bread. As much as I enjoyed my own lunch of fresh mozzarella and tomatoes, I couldn't help wondering if that woman was slicing into her bread at the same moment. Then I read your post. 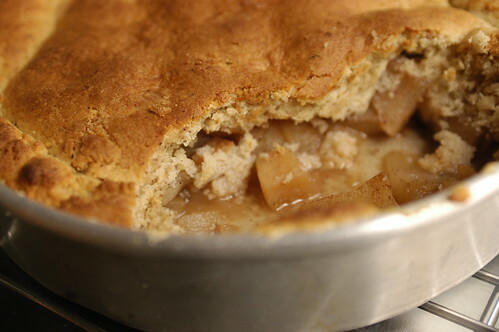 I may not be quite brave enough to try to make bread yet (I was never much of a cook, so the diagnosis has been a huge lifestyle change for me)...but I'm darn well going to give the Apple Pear cobbler a try. Thanks so much for the wonderful book and your blog. Without even knowing it, you've been a huge help to me these past few months. Have you ever tried ethopian food? They make differnt meat and vegetable dishes and serve it on injera which is a kind of spongy bread made from teff. You eat it by scooping up the peices of injera that are soaked in the flavors of the food. it's wonderful and it's very social since they serve people communal platters. Incidentally your rundown of non-gluten flour is giving me passover flashbacks! My mom makes this absolutly killer flourless chocolate cake. thank you so much for this in-depth description and information regarding gluten-free flours. although I am not gluten-free, I am always looking to experiment with different flours, to accommodate others (as a vegan, I appreciate being accommodated with foods, so I like being able to return the favor, for my celiac friends). Must add coconut flour to your repertoire! We love it, and it is very high in fiber. Makes for a very good carrot cake, great coconut fried shrimp, and a great addition in any crumble! My partner discovered it in a gluten free cooking class this summer and it changed her attitude about gluten free baking! The virtual book tour has been a blast, really looking forward to the grand finale @ David's blog! Enjoy Portland. oooh you should do a GF bread book with the chef or at least a GF bread class! When I first went gluten-free I discovered that 2/3 part white rice flour and 1/3 part tapioca flour (or potato starch will work too) would sub for 1 c. of wheat flour in most recipes. It made it easy for me, even though now I usually try to stay away from refined white flours. I love sorghum too! The name doesn't do it justice. Coconut flour is nice too, but usually needs to be combined with other flours. Soy and amaranth is usually too bitter/strong a taste for me. It is fun to experiment! Isn't baking wonderful? I bake for a living and there are days I could not imagine myself working in another station of the kitchen. Anyhow, guess what I baked today? Gluten Free Foccacia, topped with Kalamata Olives, fresh Rosmary and Olive Oil. A friend told me to watch your blog about a month ago, and it's been such a treat to read about your long and often painful journey. And to see how it's turned out. That's really fantastic. Congratulations on all counts! And thank you for generously sharing your recipes and information. I'm going to share your info with a friend who's currently being test for celiac. I pop amaranth, then grind it in my food processor. The toasty taste is especially nice in pancakes and gingersnaps, but it gives many GF items a more "baked" taste. Personally, I am in love with the mix of sorghum, teff, and brown rice flour. I think it is a fabulous mix and emmulates the whole grain baking I used to do before going gluten free. And, I agree with your whole bread thing. I add the caveat, "for gluten free", behind the pizza and bread items. I think I will forever miss gluten bread, and gluten pizza. In the beginning it felt so hard to use more than 1 flour in a recipe, and seemed too much (and I was already a person that cooked from scratch), now it's feels just as easy. It just takes time to adjust your mind and way of working in the kitchen. i actually quite like some of the gluten-free breads i've tried and baked. you're right -- it will never be my beloved sourdough... but my beloved sourdough makes me sick, so it's not difficult to skip it. This is a wonderful post, Shauna. The comments were pretty darned interesting, too! I've made injera (ethiopian flatbread) from scratch using teff flour, but most restaurants add wheat flour so you have to be really careful when dining out. I do like teff flour though- it adds a nice whole-grain flavor without being overwhelming. Anyway, thanks for the informative post! And I'm glad your book tours have been going well. Wow! What a thorough list of flour alternatives. Thanks for spending so much time on this very useful posting. Although I do not have celiac disease, I suffered from a severe wheat intolerance for several years. I decided I could not live without bread, sandwiches, etc., so I began experimenting with alternative flours. Corn, quinoa and chickpea are favorites of mine, and I absolutely swear by Bob's Red Mill gluten-free all-purpose baking flour for savory baked goods. I've had great success using it in muffin and biscuit recipes. Another fun tip: I replaced toast with rice cakes that I pop in the toaster. Spread with butter, they're unbelievable yummy! First of all, first time comment as this is, fantastic site you have -- and cheers for all the passion you put into sharing your experiences. So many different flours ... It's like fabulous science! It's funny because flour is one of those products many, perhaps most, don't think of. You buy bread in the grocery store -- that horrid, spungy loaf that sits like glue in your mouth. After 3 months in the US, I was sick of grocery store bread and whipped together my own creations with rye, whole wheat and what not. Now, with your knowledge, I'm thinking it's time to try new ways of baking. Brown and sugar! I laughed so hard because you described it perfectly! And what a great analogy to describing gluten free bread. It's true, you learn to appreciate it for what it is. Nine months ago when I set out on this adventure I hated the gluten free bread offerings, even my own homemade. But the longer it's been since eating gluten filled bread, I forget what it really tastes like and I have come to appreciate the gluten free breads for what they are. I am so looking forward to stuffing at Thanksgiving and you have helped to inspire me! Although I don't have to eat gluten-free, your description of all the gluten-free flour possibilities has me fascinated, and ready for some playing in my kitchen. And I've tasted your chocolate banana bread, so I know how good gluten-free baking can be. My wife and I have been enjoying your writing for a while. We've had a GF household for over ten years now. One other flour I like is chestnut. Love the taste and texture it imparts. It's another of those flours that mixes well with others. As for grinding amaranth: Many years ago I bought an electric food mill for $50. Mines a kTec, but there are others. I use it to grind my own rice, quinoa, and amaranth flours. I do big batches and store them in the freezer. Loud (use earmuffs), but saves a ton of money by using the bulk areas of health stores and lets you choose the exact rice you want to grind. Keep up the great work. We'll be enjoying your book and watching the blog for more great reading and recipes. I am so glad I found your site...and especially this post. I checked out a book at the library on gluten free cooking and the author gives a nice list of the flours available to use and the many different combinations but I really wanted something more...exactly what you posted. How they work best for what. I will also be looking for your book at my local book store. Thanks so much for sharing! Mesquite flour mixed with flax seeds, egg and coconut oil( or your choice of oil) makes a fabulous cracker when rolled out thin and baked for a breif moment to crisp it up. almost as good as graham crackers, if I do say so myself! thanks for a great blog on gluten free cooking. living and enjoying! 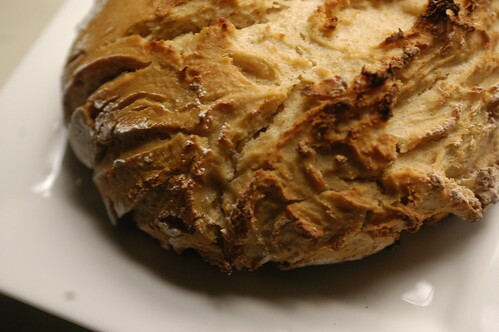 Have you heard of Breads by Anna (http://www.glutenevolution.com)? Anna makes pre-made, high quality and yummy bread mixes, pie crust mixes and pizza dough mixes. I've taken her classes at the Natural Gourmet in New York City and the breads, pies and pizzas were all delicious. This was another wonderful post. You have a way with writing that makes a reader feel as though you are in the room with a cup of coffee (and maybe some cobbler). What a wonderful guide! I don't live a gluten free life but marveled at how pleasurable you make even flour to read about! Congrats on the book release Shauna! I meant to stop by here sooner after the release to wish you well, and it seems as though you've been plenty busy and enjoying everything. That was one heck of a blog posting too! Took me a while to read it all, but good reading for sure. I liked the flour-summary area you included for everyone new to baking GF - very nice. Best wishes, and may you have continued success with the book! I am so happy to see this web site! I was diagnosed with celiac disease about 3 months ago and all I feel is gratitude for finally knowing why I have been in pain for many years and why half of my life has taken place in a bathroom. I cannot believe that after 20 years of symptoms, going to the best doctors I could find, being diagnosed with IBS, and going through many tests I finally know what to do to feel better. And I feel better! I love to cook - thank you for the inspiration. Thank you for a tremendous, inspiring blog! I have, through a process of omission that I am quite sensitive to gluten and wheat. I love to bake, and my greatest challenge is that I am a GREAT traditional cook/baker, but now I'm faced with the challenge of making my most adored dishes GF. Your blog is inspiring, and chock full of some tremendous information, and I can't thank you enough. Love your blog. I have a retreat center in Sedona, Az. Have been aware that I am sensitive to gluten for a number of years and have cut back. Use a lot of rice. After looking through your blog--I am enlightened! What wonderful news to know there are so many alternatives. I sometimes get tired of rice and that is the only thing that I had found until now. Congratulations on being mentioned as blog of the day by google. Hi, Shauna! Your blog is really interesting. My friend is allergic to gluten and I always thought he was the only one in the world. I have never heard or anyone with an allergy like that. I passed the website along to him, so he can enjoy the gluten-free recipes. I just want to thank you for your descriptions of the flours above. I keep seeing amaranth flour described as sweet and nutty. I thought maybe I had gotten a bad batch because quite frankly mine tastes like moss, but seeing your description of grasslike and earthy Makes me think my bag is OK and everyones tastes are just different. After reading more I have decided that I would really like to buy your book (maybe a copy for my mom too), but I have a question. Do your recipes (specifically the sorghum bread) require eggs and/or dairy? Thank you to everyone who posted a comment here. I love this conversation. Specifically, to FoodAllergyMom, the book is about so much more than recipes. But I have been teaching baking classes, and adapting some of them to be dairy free and egg free as well. They take some experimenting, but they can be done. A little more flax seed, some egg replaces, some soy yogurt -- it's all possible! thanks for the guide to glutenfree flours. I'm in the early stages of learning about glutenfree. So your blog has been helpful. I'm just eating up all this info! (Literally when I get home and start cooking!) I think my naturopath is about to tell me to avoid gluten because of my autoimmune urticaria (hives), so I'm preparing myself mentally right now. I thought of another possible food to make flour with that my mother-in-law cooks with in Ecuador--plantains! In Ecuador, they have ripe plantains called "maduros" which are sweet and can be baked whole for a sweet and simple dessert, and they have green plantains called "verdes" which aren't sweet (and go better w/salt) and can be cut up to make different kinds, shapes and sizes or thicknesses of plantain chips. Plantain patties (or "tortillas de verde" in Ecuador--not to be confused with Mexican tortillas--they're very different) are also common and delicious with a little crumbled cheese on top! Yummy...que rico! Hello Shauna, I found your website today 08.11.08 searching for a gluten free brownie recipe. After reading some of the comments and some of your responses I was drawn to you and began researching your site. After reading several different stories and the information about your pregnancy and birth of your child, I added this site to my favorites and will actively participate in your posts and receipes. May God continue to bless you and your family. My two year old son and I cannot have gluten and he cannont have dairy. I like others felt that life was over with food with a gluten allergy. I love cakes and cookies occasionally and because of my sons dairy allergy, I spend lots of time and money in the healthfood store looking for snacks above all else for him to eat. I've discovered Kinnickinik and Namaste amongs other brands that are good to taste but hefty on the pocket so reading your site and reviewing your recipes inspires me to what to try "creating" things in my kitchen by purchasing the appropriate "staples" for my kitchen. Thank you so much for sharing as I too feel/fealt such a connection to you after reading your post. You are very inspirational...God bless. Just found your site, and I am sooooo happy! Our 2 y.o. daughter has been gluten/dairy free for almost a year. I had gone along for the ride primarily because I was nursing her at the time and gluten as well as casein (dairy component) are passed along through breast milk. I lost 50 lbs. without trying! (and I need to do so!) Secondarily, I love food, and I figured if I loved what I ate, then so would Sophia! It kept me from being lazy, to say the least. Gluten free foods are far more expensive in the store, so I began experimenting, but had not had much luck with breads. I did find a mix at the store that it tolerable albeit expensive. A question on sorghum flour. I found a "sweet sorghum flour". Is this the same as sorghum flour, or is it an entity all its own. I made pizza crust, which my daughter devoured...of course, it was so sweet, it tasted more like a cookie than crust! Any ideas? Thank you, thank you, thank you for this post. Your insight about Tootsie Rolls and appreciating GF food as it is was SUCH a revelation to me. It seems so simple, now! :D Unfortunately, I can't have them anymore (since I am also dairy and soy free in addition to the gluten), but I distinctly remember their taste. They were also my favorite when growing up. Anyway, the thought sticks with me daily. I constantly remind myself to appreciate my foods as they are, not what I hoped or want them to be. I just think "Tootsie Rolls" and I am instantly relieved, inspired and motivated. I know this may sound strange, but I think I am at peace with my diagnoses for the first time, and I was diagnosed 8 months ago! I have you to thank for that. So, from the bottom of my heart, thank you! Hi Shauna, thank you for the gluten-free flour information. I have been working with one of our local casino's to find some gluten-free desert options, and have been trying to come up with a good crust on a berry crisp, without using oats. Your information is always great. Hope all is well with you and little bean. Hi Shuana, thanks so much for sharing the recipes you have put together! I have a gluten-free 2 year old son who misses out on some of what I consider the most glorious childhood traditions. But with your recipes for cobblers, cookies, breads, and more I can give some of those special times back to him. This Thanksgiving will be our first since he was diagnosed, and I was bemoaning the family get together where most of the food would be unedible for him, until I saw your cobbler recipe...finally a way to treat him to lovely tastes and memories! Thank YOU! Hi Shauna, My 8 year old has celiac disease. But the flours to use are very expensive. Do you know how to make any. And can I use cornstarch instead of flours? A mother in need! Thanks Wendy in Pa.
12/3/08: Bob's Red Mill gluten free bread mix comes out wonderfully from my bread maker, though I do have to premix it. It makes wonderful toast, too - I'm not missing wheat bread at all! Bob's Red Hill now has a GF oat flour. It added a nutty texture to a bread mix I've been working on. Right now it's brown rice, quinoa, oat, sorghum and buckwheat. This is the best combination so far. I just found this blog and I will order your book :) My 5 year old girl has celiac disease and diabetes. We actually think this is a perfect combination! Natural gluten free food is good for her diabetes. The whole family have reduced the use of food with lots of carbohydrates, and try to eat more eggs and vegetables. I also make gluten free bread and she likes it (so do I ;) ) We have always tried to focus on all the good food she can eat, and she is a happy little girl who enjoys food. I will say that having celiac disease in our family has added more quality to our lives! :D (even if we have to admit that it is more work). In Norway, where we live, we are lucky to have a great health care system. The state pay 280 dollars per month for each individual with this diagnosis, to cover the expenses of a special diet (no insurance needed, we have a different system than in the US) The medicin for her diabetes is also free for the rest of her life, and the state also provides us with money because of her diabetes. All in all, the states pays us close to 600 dollars per month for her health issues. We use every penny to buy good food for her, good meat, fish, vegetables, lots and lots of fruit and all the gluten free products that we want. I feel very lucky. Thank you again for this site! Hi there! Does anyone here know anything about using Jerusalem Artichoke Flour in pasta, bread, etc? Thanks! If you live in the UK there is an amazing company called 'Dove Farm' who produce gluten free plain and self raising flour, and you really cannot tell the difference! Cakes taste exactly the same as they used to. I don't thinkk it's available in the U.S. yet, but in the UK it's sold in the major supermarkets and is way better than any of the stuff you can get on prescription! Hi Shauna - I've just read your entry on flours and your comments about gf breads. As your column was written in Fall 2007 I'm hoping you've since discovered more agreable gf breads. If not, do not dispair! You can make fabulous tasting gf bread (and eat it too!. Bette Hagman, the Gluten-Free Gourmet, published a bread book. Her recipes are unbelievably good. You cannot tell they are made with gf flours. I've been making bread for the last 4.5 months for my celiac son. He loves the stuff and it's hard for my husband and I not to steal a slice every so often. It's so good. Thank goodness for Bette Hagman. She will be greatly missed. Thanks for your on-going blog. You might want to mention that tapioca flour is an anti-thyroid food and should be avoided by anyone with concerns about thyroid function. I'm working on a process for gluten free baking that I think will make a big difference. At least I hope so! I didn't know tapioca flour had thyroid issues??? I was recently reminded that I still have a love of Tootsie Rolls as I polished off the leftover Halloween candy last month. I'm glad to find your blog (we have 5 celiac friends and we make sure to have options for them - and the "there is fruit" option is not good enough). Miriam, I just found your site and love it. I was diagnosed with a gluten allergy when I was two, and that was 45 years ago. I was one of the fortunate ones to be diagnosed early on. I love cobblers and can't wait to try out this recipe. We have a wonderful orchard we love to pick at in the fall that grows apples and pears. Thank you! Please forgive me, my last post I left with the name Miriam instead of Shauna. You can obviously disregard the post for such an error! Thanks for your insightful website.